Alvin Ailey American Dance Theater will share its unparalleled artistry with audiences from coast to coast during a 19-city U.S. tour starting this Friday, February 3rd, in Philadelphia, PA. On February 7th, a week-long engagement at The Kennedy Center in Washington, D.C. kicks off as part of JFKC: A Centennial Celebration of John F. Kennedy, the Kennedy Center’s yearlong programming initiative marking the 100th anniversary of John F. Kennedy’s birth and legacy. On Tuesday, February 7th, Alvin Ailey American Dance Theater’s 18th Annual Washington, D.C. Opening Night Gala Benefit will celebrate the opening of its yearly week-long engagement at the John F. Kennedy Center for the Performing Arts. After the 7pm opening program at the Opera House featuring performances celebrating the birth centennials of jazz legends Ella Fitzgerald and Dizzy Gillespie and Alvin Ailey’s always inspiring masterpiece Revelations, Artistic Director Robert Battle and Ailey’s renowned dancers will join guests for supper and dancing on the Terrace Level of the Kennedy Center. 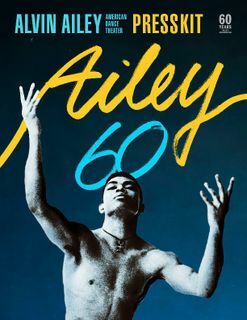 A long-beloved member of the Atlanta community with a 41-year history in the city, Ailey announces programming for Alvin Ailey American Dance Theater’s performances at the Fabulous Fox Theatre February 15 – 19, 2017, as well as for the pilot year of Ailey’s “Destination Dance” partnership initiative in Atlanta. Destination Dance will allow Ailey to better serve the Atlanta community by deepening its commitment to the city’s cultural organizations – including Atlanta Ballet and Atlanta Ballet Centre for Dance Education, AREA, Dance Canvas, ELEVATE, the Fox Theatre, Spelman College, the Center for Civil and Human Rights, Rialto Center for the Arts, and High Museum of Art – through diverse year-round programming, ranging from performances to dance classes to educational programs for students. 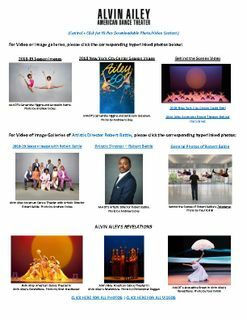 Artistic Director Robert Battle and Alvin Ailey American Dance Theater invite audiences of all ages to experience the 2012 Family Matinee series - performances on Saturdays at 2pm in December that are all followed by a question-and-answer session with Ailey’s acclaimed dancers. Alvin Ailey American Dance Theater will kick-off a five-week holiday season on November 28th with a star-studded gala benefit performance at New York City Center and party at the Hilton New York. Academy award-winning actress and comedienne Mo’Nique will serve as the evening’s Honorary Chair and Alvin Ailey’s timeless masterpiece Revelations will be sung live with special celebrity guests onstage.